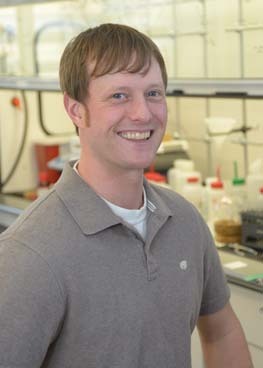 Bryan T. Mott joined NIH in 2007 and is now serves as a staff scientist in medicinal chemistry at NCATS. Mott works to optimize small molecules identified in high-throughput screening. He also is part of an interdisciplinary project team with a diverse target portfolio (e.g., oncology, anti-infectives, metabolic diseases). Mott holds bachelor’s and master’s degrees in chemistry from George Mason University. He received a Ph.D. in chemistry from Johns Hopkins University, where he worked with Gary Posner, Ph.D., on the synthesis of natural product-derived artemisinin derivatives for the treatment of cancer and cytomegalovirus. During his graduate studies, Mott had a joint appointment with NIH under Craig Thomas, Ph.D.; in this position, he evaluated drug combinations for the treatment of malaria in a high-throughput fashion. He joined NIH as a full-time staff scientist immediately upon completion of his degree. Mott is highly engaged in chemistry and biology, maximizing the collaborative environment that NCATS facilitates. His research interests include medicinal chemistry, chemical biology, synthetic methodology, and rare and neglected diseases research. He focuses on the medicinal chemistry optimization of small molecules toward demonstrated activity in proof-of-concept animal models and on facilitating novel biological research. His ultimate goal is to facilitate advancement of these compounds into pre-clinical and clinical studies that enable an Investigational New Drug application to the Food and Drug Administration.